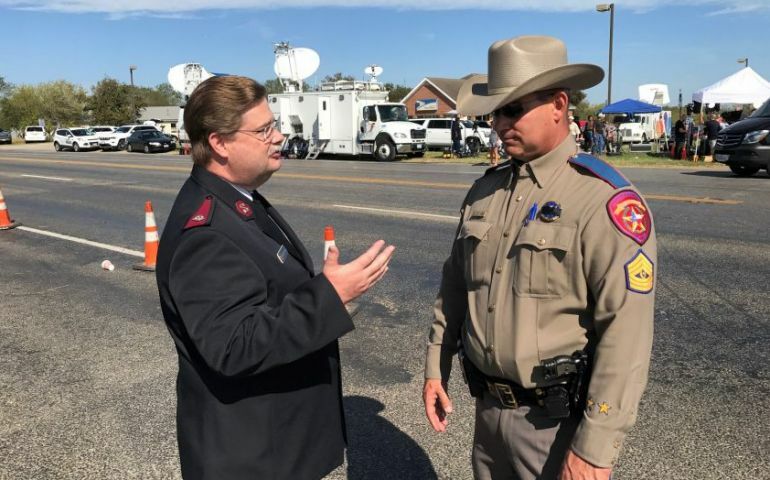 San Antonio, Texas (November 6, 2017) – Officers and staff from The Salvation Army in San Antonio were deployed to provide emotional and physical support within hours of the tragic shooting at the First Baptist Church in Sutherland Springs, Texas, on Sunday. The Salvation Army’s mobile kitchen arrived on the scene at around 5:30 PM and Officers spent time ministering to relatives as they waited on word about their family members. “We were able to give water and snacks but most importantly we listened to many of the families share stories about their missing families. We prayed with many of the families,” said Major Carolynn Webb, Associate Area Commander, The Salvation Army - San Antonio Metropolitan Area Command. It is anticipated that The Salvation Army will continue to provide emotional and spiritual care to the community, serving three meals a day to first responders at the scene for at least the next 72 hours. Several Salvation Army Officers are available to speak with and pray with family members. We have all been shaken by the tragic events of Sunday afternoon in the beautiful community of Sutherland Springs, said Lt. Colonel Ronnie Raymer, Divisional Commander of The Salvation Army in Texas. Our thoughts and prayers go out to all who have been affected by this atrocity and especially those who have lost loved ones and have injured family members. The Salvation Army will remain in the community providing nourishment, with listening ears and praying hearts, for as long as we are requested to serve. Emotional and spiritual care is a unique aspect of The Salvation Army Emergency Disaster Services, with trained personnel available to speak to and pray with disaster survivors and first responders in times of crisis and stress. The Salvation Army, an evangelical part of the universal Christian church established in 1865, has been supporting those in need in His name without discrimination for 130 years in the United States. Nearly 30 million Americans receive assistance from The Salvation Army each year through the broadest array of social services that range from providing food for the hungry, relief for disaster victims, assistance for the disabled, outreach to the elderly and ill, clothing and shelter to the homeless and opportunities for underprivileged children. 82 cents of every dollar spent is used to support those services in 5,000 communities nationwide.